Kathleen A. (nee-O’Rourke) Schlitt passed away on Monday, April 1, 2019 at Compassionate Care Hospice in Dover, NJ after a courageous battle with Alzheimer’s and Parkinson’s disease. Kathy was born in Bayonne, NJ to Frank and Ruth O’Rourke (nee Fitzsimmons) and moved to Parsippany, NJ when she was 10. She graduated from Parsippany High School in 1964. Kathy was a graduate of Ladycliff College, NY with a BA in mathematics. After college, she worked for Metropolitan Life Insurance Co. in New York City as an actuary. She took time off from work to raise her children and later worked as a bookkeeper for Riker, Danzig, Scherer, Hyland, & Perretti in Morristown, NJ. She also enjoyed traveling, gardening and reading. Her travels spanned Europe, China, Egypt, Thailand, Costa Rica, and Australia. She particularly enjoyed spending time with her family at the shore, frequenting Ocean City and Long Beach Island with them over the years. Her other loves included the Villanova Wildcats and the Providence Friars college basketball teams as well as the New York Yankees. 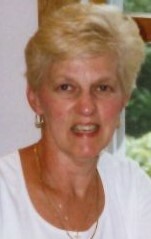 Kathy was married for almost 50 years to her devoted husband, John, and has two beautiful children, Brendon and Heidi. Both children are married, Brendon to Cynthia who gave her three grandsons: twins, John and Benjamin, and Teddy; Heidi to Paul Munn who gave her grandsons Callum and Preston. She cherished her family dearly.